Swiss Gear’s designed set includes 3 pieces of fully expandable luggage with the standard checked 28-inch full and 24-inch medium, and a small checked bag at only 20 inches. 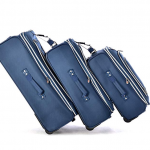 These suitcases feature a durable padded look which is also quite contained and functional for traveling through crowded airports and busy city streets. 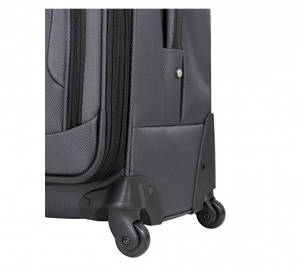 Each suitcase runs on 4 spinner wheels for upright mobility rather than the angled mobility you get with in-line skate wheels, additionally traveling components include top and side haul handles along with a lengthy extending telescopic handle. The look of each suitcase is business casual and a little bit sporty with full grey coloring offset by silver zippers and handle. This is typical for a Swiss Gear suitcase, for instance Swiss Gear’s Sion Carry-On in Blue only comes in the one color for its design, just like this set is fairly limited and only available in grey. At 20-inches the carry-on will easily meet all national and international carry-on standards for overhead compartments, however it is somewhat more limited if you’re not using the expanding zipper for a total of 50 liters packing space. 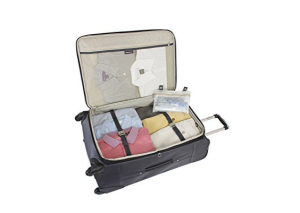 Each suitcase includes additional storage with two exterior face pockets (one fairly shallow and ideal for travel papers), and interiors which allow you to best utilize the space with two tie-down straps that will hold your clothing into a firmer shape; one deep ceiling mesh pocket is also included and quite ideal for keeping shirts and suit jackets wrinkle free. The large checked bag offers up to 120 liters unexpanded, meaning its storage capacity is vast but also capable of just inching under imposed weight limits so that you don’t incur extra fees; and if you pick up more belongings abroad merely unzip that expansions and pack! Last but not least, the second checked bag at 24-inches is small enough to be interchanged as a carry-on for a limited number of domestic and international flights, but large enough to offer 85 liters of packing space (expanded) for a 5-day trip. 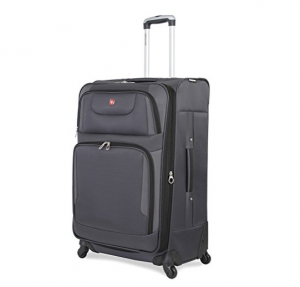 One draw back is that Swiss Gear luggage expands to 1.5 inches rather than the industry standard 2-inches you get with any lightweight Travelpro suitcase such as the 20-inch Platinum Elite Expandable Carry-on. Swiss Gears’ Expandable set includes two front facing zippered pockets and two side zippers, one for the main compartment and the other for expansion up to 1.5 additional inches. This expansion uses ultra-strength webbing and nylon fabrics for a stretch that won’t rip and won’t get damaged during travel. 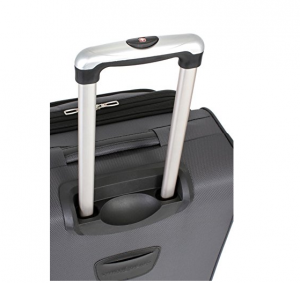 Suitcase tops and bottoms feature high quality mobility with an ergonomic aircraft grade aluminum handle that extends smoothly and four spinner wheels screwed into the frame of the suitcase rather than riveted and easy to break. All wheels are 360-degree multidirectional spinners and offer the maximum amount of maneuverability in well populated areas and on well paved roads; for thick carpets and rough cobbled streets in-line skate wheels are preferred. Interior features include two tie- down straps which really help you divide your belongings down the middle of a suitcase, one attach in toiletry kit, and a zippered mesh pocket that’s big enough for pressed shirts, your shoes, or just general extra organization purposes. Finally, all side haul handles are made from padded webbing for extra strength, and Swiss Gear has also included self-repairing zippers with zinc dye cast zipper pulls. For the most part Swiss Gear design’s bags which are easy to use and showcase lightweight softshell materials and they don’t put out very many hardside options, which is ideal when you’re trying to keep suitcase weight low in order to avoid additional fees. At 20-inches the carry-on size weighs 7.5 pounds empty, just lightweight enough to allow around 35 pounds before you hit that threshold of having to check a bag you could have carried on. Likewise, the medium and large bags don’t go up much in weight for their size and optional expandability; the 28-inch full checked bag weighs 10.3 pounds unpacked, with the 24-inch bag checking in at 8.5 pounds unpacked. Pairing all three together for your next adventure will mean having to check two bags at once, but the plus side is the packing space (200+ liters) to easily make a 4-week trip comfortable. If there is one major statement which can be made for Swiss Gear luggage sets, it’s that their zippers and zipper pulls will stand the test of time; these elements are highly durable, made from strong materials, and self-repairing as you use them. Other small durability items include the telescopic handle made from the highest quality material – aircraft grade aluminum – which raises easily and locks in place while you’re on the move, strong spinner wheels, and side/top haul handles made from thick webbing. 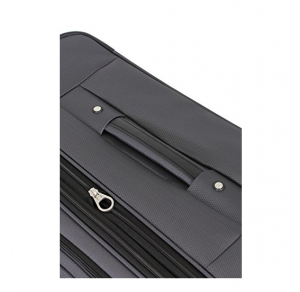 The suitcase bodies themselves are made from ballistic polyester which is durable for most travel and resists scuffing and tearing, however there’s no denying that cotton canvas or nylon bags are stronger, though certainly more expensive as well. Additionally, each suitcase in this set include extra foam padding designed around the top, bottom, and front of the bag, further reducing the amount of damage a drop or collision will have. Stated before in the design section of our review, the style options for these suitcases are very limited. Swiss Gear typically assigns one color or pattern per one suitcase, and because of this, travelers with similar bags can get them mixed up. If you have a Swiss Gear bag its always best to keep your identification written on a card in the handy pull-out ID tag, and you can also always accessorize your bag with certain stickers, bows, or whatever you think will make it stand out on the luggage carousel. For the most part though, the plain grey design is quite formal and good looking for most occasions.  The only let down is that Swiss Gear, compared to their competitors like Pathfinder Luggage, have always had a pretty static style – one which is great for all travel and all people, but not necessarily conforming to a traveler’s particular sense of self. Whereas most sets from Pathfinder, like their Presidential 4-Piece Set, offer at least the bare minimum with 4 simple styles. What they limit in style they make up for in size and added expandability; few other brands can match Swiss Gear luggage sets when it comes to storage space and size options for checked bags and carry-ons. In fact, this sets 20x14x8.5-inch carry-on would typically be small enough to fit comfortably overhead but not usually fit much, but with Swiss Gears innovative expansion and multiple pockets you can easily fit two days’ worth of just clothing in your carry-on. For even more space, both checked bags size in at the standard checked size but don’t nearly weigh as much as other brands; the large checked bag sizes in at 28x18x10.5 inches, while the medium bag sizes in at 24x16x9.5 inches. Additionally, all three suitcases are nestable for simple storage, and for short trips you have your pick from three exceptional choices. All suitcases are fitted with a 3 year or 5 year included warranty upon any purchase of a Swiss Gear suitcase or set; this warranty includes repairs or replacements based on material or workmanship errors, but will not cover general negligence. If a defect occurs Swiss Gear will only repair or replace a piece, suitcase, or set based on their own discretion and proof of the original sales receipt. Finally, for additional purchase a 10-year warranty is available on select products, so make sure you talk to the distributer to find out if this is an option for your set. 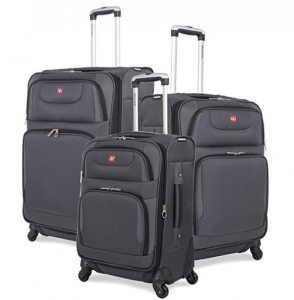 Swiss Gear’s 3-Piece Expandable Set with Spinner Wheels is fairly simple at a glance with basic design features that are business friendly but also great for any general travel; going deeper into what each suitcase has to offer shows 1.5 inches of additional expandability, up to four different pockets for organizing your things, and lightweight materials which will always help you keep your bag under imposed weight restrictions. These bags have a somewhat limited durability and use ballistic polyester materials, however for minor to medium bumps, drops, and bruises the 20-inch carry-on, 24-inch medium, and 28-inch large will all resist damage and hold up well against the general wear of time. These lightweight suitcases help you skate under airline weight limits. Swiss Gear has some of the strongest zippers and zipper pulls. 200+ liters of packing space when traveling with all three bags. 1.5 extra inches of packing space with an expandable zipper. Style options are limited to grey. Materials aren’t as durable as nylon or cotton canvas. This set is medium-expensive for the average traveler.